The first Victoria Florin was circulated in 1849 and it is known as the "Godless" florin because it is missing the words "DEI GRATIA" (For The Grace Of God). It was also Britain's first decimal coin being worth one tenth of a pound. It was replaced two years later in 1851 by the "Gothic" florin. The Gothic florins continued until 1887 but interestingly all the dates on them are in Roman numerals. 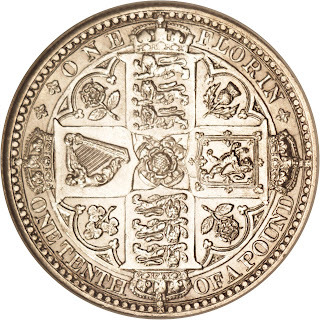 The obverse of the "Godless" and "Gothic" florins were designed by William Wyon, Where as the reverses were designed by William Dyce. 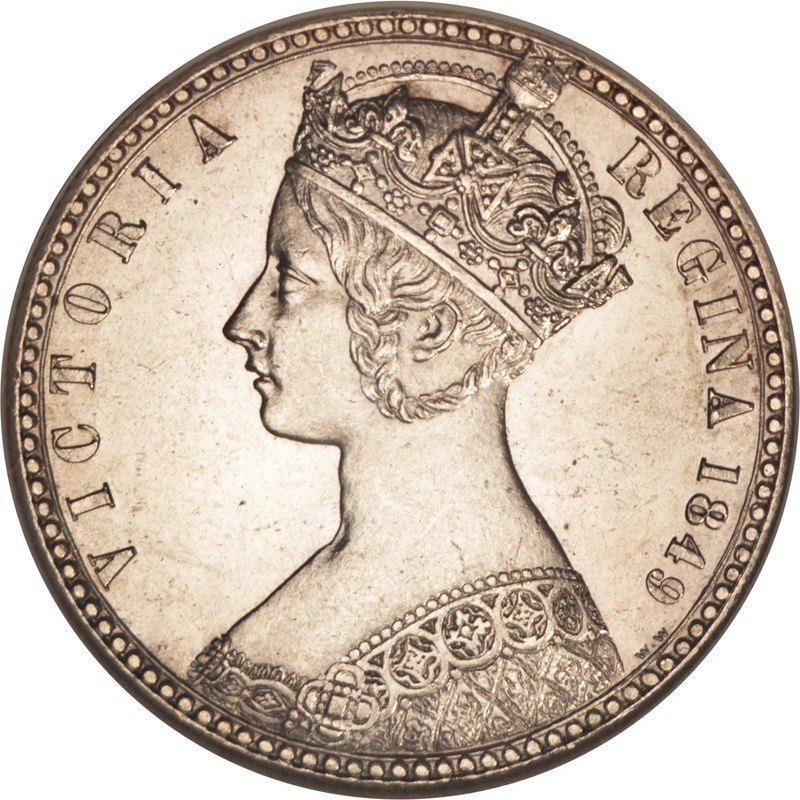 Obverse: Bust of the young Queen Victoria, shows her wearing the new Imperial State Crown, and with a long hair braid, wearing a dress richly embroidered with roses, shamrocks and thistles. The engraver's initials W.W. for William Wyon, appear raised to the right of the bust. 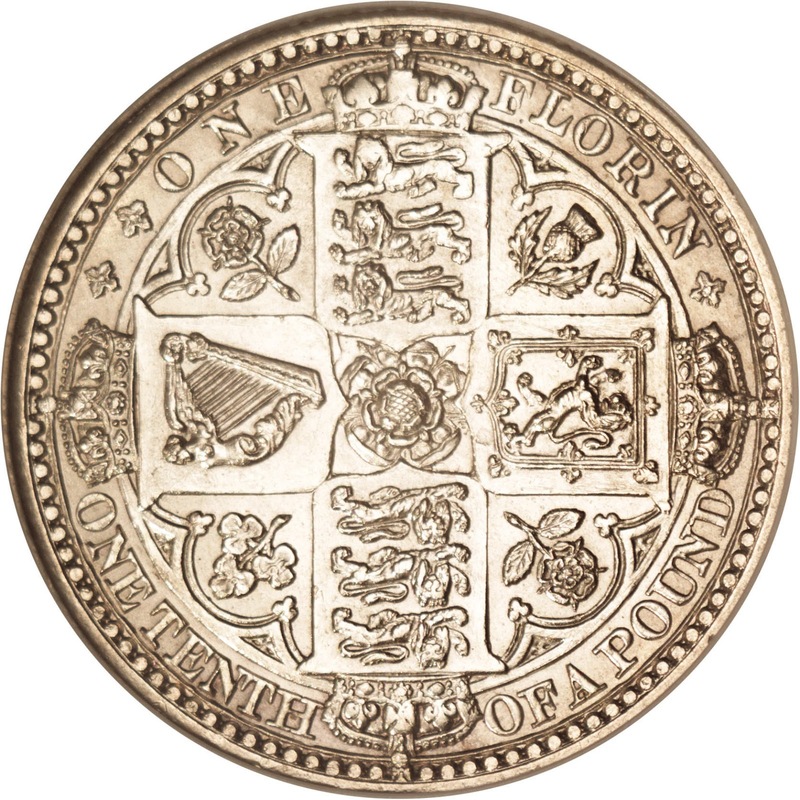 Reverse: Crowned cruciform shields bearing three lions passant for England, lion rampant for Scotland, and harp for Ireland. In the angles are roses, a shamrock and a thistle. In the centre there is a double rose.All contained within a deeply tressured circular panel. The reverse design was also by William Wyon. Value: 1 Florin = 2 Shillings. References: KM# 745, Sp# 3890. Great Britain 5 Pounds Gold Coin 1839 Queen Victoria "Una and the Lion"
British Coins Halfpenny 1862 Queen Victoria "Bun Head"
One Mohur of Queen Victoria of 15 Rupees 1862 Queen Victoria "Gothic"